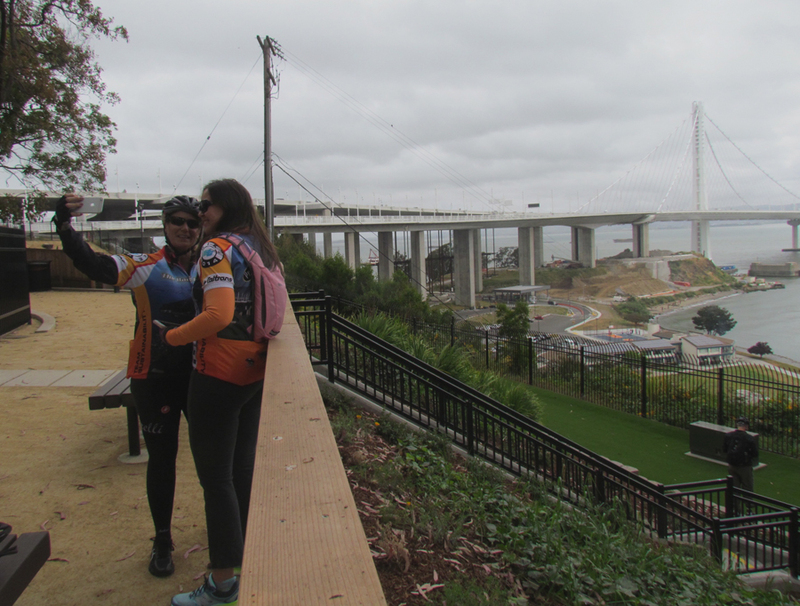 Caltrans Director Malcolm Dougherty marked the recent release of Caltrans’ new statewide bike and pedestrian plan with a multimodal field trip yesterday. 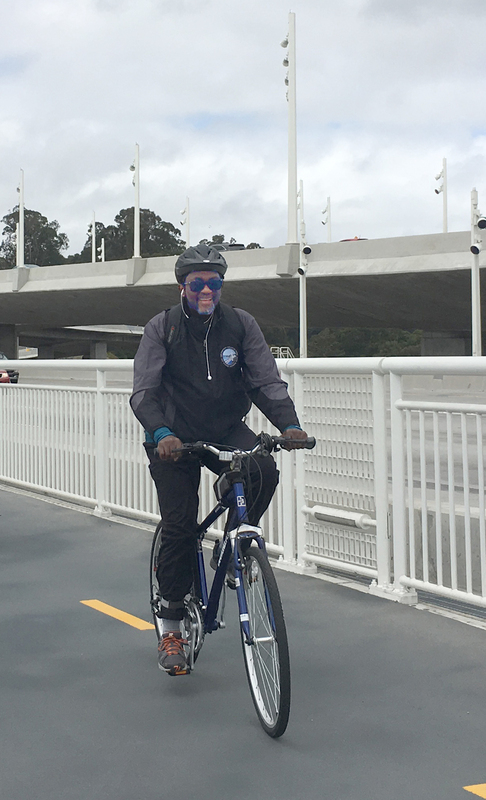 He and a group of Caltrans staff brought their bikes on the Capitol Corridor train from Sacramento to Emeryville, then rode the Alex Zuckerman Bicycle/Pedestrian Path along the Oakland Bay Bridge to the new Vista Point on Yerba Buena Island. 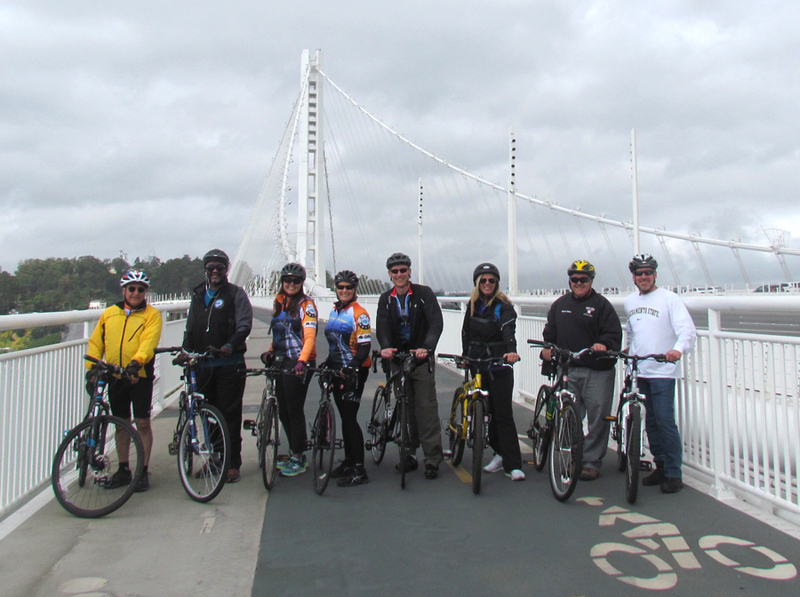 Dougherty was joined by local District 4 Director Bijan Sartipi and staffers from headquarters, as well as a few of Caltrans’ partners in Sacramento, on what for many of them was their first ride on the bridge. The bike/pedestrian plan was released earlier this week (Streetsblog covered it here), and Director Dougherty was happy to answer questions about it before the ride. The plan calls for taking actions that will encourage more biking and walking trips, which is a giant shift for a department that until a few years ago was known as the state highway department. So naturally the first question was how the plan will be translated into action, given Caltrans’ reputation as a big, cumbersome, slow-to-change bureaucracy. The first priority action items include things like getting bicycle and pedestrian safety information into the DMV driver’s handbook; researching methods for setting and enforcing speed limits—as opposed to the current 85 percent rule used by the state to avoid charges of creating speed traps; focusing on closing gaps in existing bike and pedestrian networks; developing resources on best-practice bike and pedestrian design treatments; and rethinking safety analysis with an eye to the higher risks faced by vulnerable users. “One of the things that’s going to be a challenge for us is data,” he said. “Safety and volume data for bike and ped trips is a little harder to track.” But, he said, there are a lot of different ways to get that information. For example, apps like Strava can provide some trip information. However, said Dougherty, “That’s only going to give a partial picture. Very close to none of your kids riding bikes to school are going to be using Strava, so you’re not capturing those trips.” On the other hand, that kind of trip tracking is easy, and it gives a general indication. And cities differ widely. “Some cities are pushing us when it comes to biking and peds, and we’re pushing some cities. That’s just the way California is,” he said. In addition to measuring progress, another key will be tracking investments, he said. Currently the Active Transportation Program provides money specifically for bike and pedestrian projects and programs. But one of the requirements of the recently passed transportation funding bill is that every rehabilitation project include consideration of all users of the facility, as well as sustainability issues. That means some money for almost every project should go towards bike and pedestrian issues. In addition, S.B.1 includes almost $25 million for planning purposes. “We still have to figure out the appropriate way to distribute those grant dollars for planning,” said Dougherty. “But that should help some of the local agencies” that need to add capacity to fix their infrastructure. Caltrans itself needs to add staff. “We’ve got an organization chart that we envision for [new Sustainability Chief] Ellen Greenberg’s office, as well as in each of the districts. That org chart is not in place yet, but we have a vision for it,” said Dougherty. “We’ve identified resources that we need for the sustainability office, and for sustainability activities. But we have to work through a process to get all of those resources,” he said. All this also requires training, of current Caltrans staff as well as local partners. “We’ve got to get all our project delivery staff to be thinking about [all users] when they’re doing a project,” said Dougherty. “And about the complete project, not just the rehabilitation portion of a project. It will take us a while to make sure that every project does that,” he acknowledged. Caltrans has already spent time training its own staff in the process of creating a sustainability office and refocusing on the transportation needs of all users. “Expanding that is something I’m going have to put some more thought into, as far as training,” he said. The ride was leisurely. 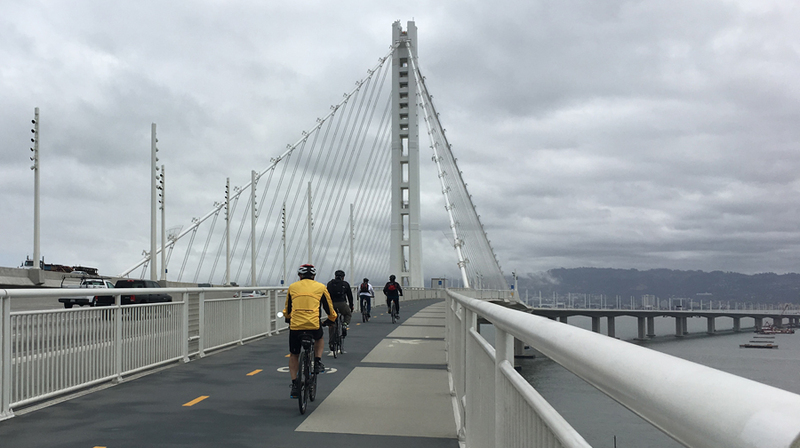 Yesterday’s weather was cool and overcast, and few other bridge riders were out in the middle of the day. There were lots of selfie-worthy moments, and conversations ranged widely. We talked about the technology that protects the new bridge from rust (dehumidifiers in the tower) and the history of the two Mayor Browns (Willie and Jerry, San Francisco and Oakland) and their fight over the placement of the new span. We also touched on the difficulties posed by the new bike lane coming soon to the much longer and hillier—and windier—Richmond San Rafael Bridge. And we talked about how the idea was floated to ban bikes on Highway 35, and what the outcome of that controversy might be (a meeting is planned for next week between Caltrans staff and bike advocates to work out a solution for that dangerous stretch of road). The riders even stopped for a moment to find the bridge troll (shhhh) and talk about why it’s tucked under the bridge. 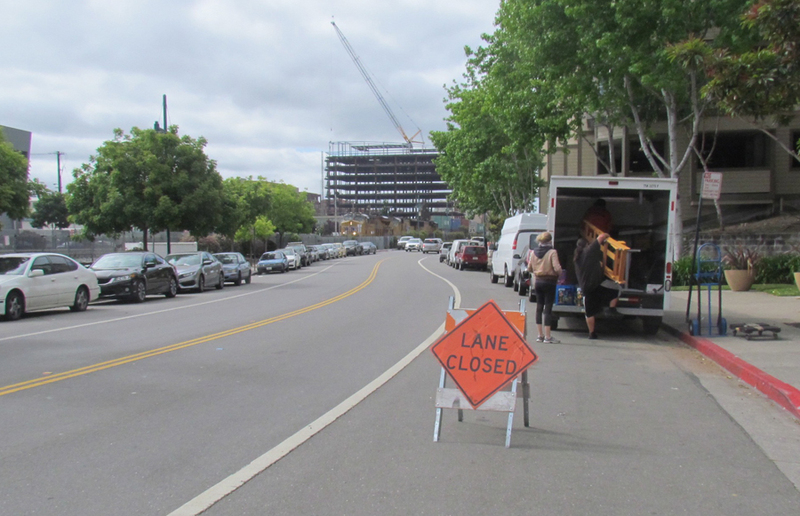 The trip from the train station to the bridge itself was a little more circuitous than it normally would be, due to construction in the area that forced traffic on a detour. That in itself shouldn’t be a problem, as long as new riders can find their way back to the station. But in several places signs warning of construction ahead were placed in the bike lane itself, forcing the riders to go around them, sometimes in busy traffic. The first step is to change the way Caltrans engineers think. Too many of them insist that “safety” requires wide roads, no trees or other visual blockages, straight lines, and lots of visual and sonic reminders to car drivers about staying in their lane. Instead, all of these designs rules encourage drivers to drive faster, and lull them into believing it’s okay to glance down at the phone they’re hiding in their laps–or have attached to their windshields, for gawdsake– while navigating these “safe” roads. OH my. Thanks for that catch–and for clearing up where that error came from. The 85th percentile rule isn’t the problem, street design is. The simple fact of the matter is that too many of California’s streets are overengineered and designed for speeds higher than what is safe. The 85th percentile rule already allows for speed limits to be lowered if the street is redesigned for lower speeds, so the focus needs to be on promoting the use of low-speed designs, not just changing the signs. Caltrans guidelines still prioritize the movement of cars over the safety of other users, despite other state efforts to address the problem. The California Bicycle Coalition is asking the department to update its guidance. Thursday Registration Deadline For Caltrans Planning Conference In L.A.